Domaine la Barroche is one of the new super stars in the Chateauneuf du Pape appellation. This is due entirely to recent changes in their wine making and vineyard management techniques. But the truth is, Domaine La Barroche has a long history in the Southern Rhone Valley as they are one of the older properties in the Chateauneuf du Pape! In fact, they date all the way back to the 17th century. 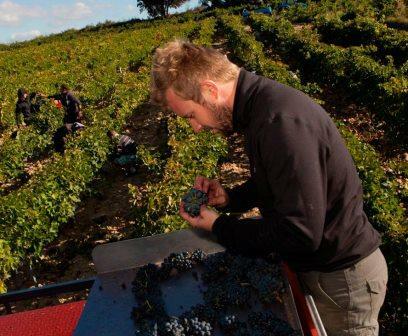 Domaine la Barroche was founded when Alexandre Barrot began obtaining land in Chateauneuf du Pape. Those original purchases, which became what we know of as Domaine la Barroche, along with more land bought at later dates, have remained in the hands of the same family for hundreds of years. The beginning of the modern era for Domaine la Barroche starts in 1972 when the Barrot family, headed by Christian Barrot began expanding their Chateaunuef du Pape vineyards. In 1972, the estate was only slightly more than 2 hectares in size. At the time, their fruit was bought by negociants and sold under the name of “Lou Destre d’Antan.” The name was a hommage to his grandfather. The next jump forward for Domaine la Barroche occurred in 2002 when the son of Christian Barrot, Julien Barrot joined the family business. The following year, 2003 was the first time people began taking notice of what was taking place with the wines of Domaine la Barroche. 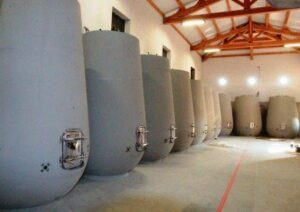 One of the first improvements at the estate Julien Barrot requested was the addition of three new vats that would allow for the fermentation process to take place based on specific parcels or grape varieties. In 2006, the young Julien Barrot was given a lot more responsibility and things have never been the same. Today, the charming Laetitia Barrot Latour helps her brother, Julien Barrot in managing the estate. In 2015, Domaine la Barroche completed a massive renovation and modernization of all their cellars and wine making facilities including adding new, conical shaped concrete vats for fermentation. The estate now partially destems their grapes and most of the aging takes place in foudres. Currently, Domaine la Barroche owns 15.5 hectares of Chateauneuf du Pape vineyards on stony, sandy terroir, dedicated to the production of red wine. Although there are portions of the vineyards that are not currently in production. While their best terroir is sand and rock covered soil, you also find limestone and even red clay and iron enriched sandstone soils. Some of their best terroir is a parcel of vines located next to Rayas. Most of their vineyards are situated in the northern part of the appellation. They have old vines which average more than 70 years of age. However, they have very old vines as well. In fact, some of which are more than 100 years age! While Grenache is of course their primary grape planted, they have have smaller plantings of Mourvedre, Syrah, Cinsault, Clairette Blanche, Vaccarese, Terret Noir and Clairette Rose. While most of their vineyards are planted to red wine grape varieties, in their holdings, .5 hectares are reserved for the production of white wine grapes for Chateauneuf du Pape Blanc. At Domaine la Barroche, the fruit is sorted in the vineyards and again at the cellars before being cold macerated, prior to harvest. A portion of the Grenache can be whole cluster vinified. The wine is aged in concrete vats, small barrels or large foudres. The grape variety determines which vessel is used. The best vintages for Domaine la Barroche are: 2016, 2015, 2012, 2010, 2009, 2007, 2006, 2005 and 2003. Domaine la Barroche has added and removed from their lineup of wines produced at the estate since 2003. By 2006 they were releasing 4 different wines. That is no longer the case. Starting with the 2012 vintage. Domaine la Barroche produces 2 red Chateauneuf du Pape wines. In 2015, they added a new wine to their portfolio, La Barroche Liberty, which is sold as a Vin de France. However, starting with the 2016 vintage, La Barroche added a white Chateauneuf du Pape to their portfolio, Pure Blanc. In total, the average annual production is about 3,000 cases of wine per vintage. Domaine la Barroche Cuvee Pure – Pure is produced from between 97% old vine Grenache to 100%% depending on the vintage, hence the name Pure. The label is stark white, to further the Pure theme. The terroir is pure sandy soils in the Grand Pierre, Rayas and Pointu lieux-dits. The vines are old, having been planted back in 1901. The vines are quite close to Rayas. The grapes are partially destemmed. The vinification is conducted in concrete vats. Malolactic fermentation takes place in tank. The wine is aged one, large, old oak foudre for about 18 months before bottling. This wine can be quite difficult to find as less than 300 cases per year are produced. For some reason, at least with the 2007 vintage, two separate bottling’s were produced, one was filtered and the other was unfiltered. There is no way to tell which you’re buying. Domaine la Barroche Signature, produced from a blend that varies from 65% Grenache, 15% Mourvedre, 15% Syrah and a portion of Cinsault, along with various allowable grape varieties. The terroir is a mix of sand, stone and clay soils. The vines are quite scattered over the appellation as they are planted in the Bois Dauphin, Cabrieres, le Grand Pierre, les Mascaronnes, Palestor, le Parc, le Pied Long, Pierre a Feu, Pointu, and Rayas lieux-dits. The grapes are partially destemmed grapes for this wine come from vines that vary in age from 18 years of age up to 100 years in age. La Barroche Signature is aged in a combination of foudres and stainless steel vats. The Grenache is aged in foudres, the Syrah and Mourvedre is aged in French oak barrels and demi-muids and the Cinsault is aged in concrete vats for an average of 18 months. Domaine la Barroche Cuvee Pure Blanc In 2016, the estate introduced a new white wine made from 100% Clairette. Domaine La Barroche Liberty – The wine is made from old vines, manu of which are almost 70 years old. Dominated by Grenache, the fruit comes from vines placed in both the Cotes du Rhone appellation and in Chateauneuf du Pape. Due to AOC laws, because the grapes come from 2 different appellations La Barroche Liberty is sold as a Vin de France, and not a Cotes du Rhone. The first vintage was produced in 2015. La Barroche Liberty comes from a blend that is on average 55% Grenache, 18% Syrah, 12% Mourvedre, 2.5% Carignan and 2.5 Cinsault, although that can vary, depending on the vintage. La Barroche Liberty while quite tasty, is a wine to drink in its youth, between 5-7 years of age. Domaine La Barroche can be enjoyed on the young side. Young vintages can be popped and poured, or decanted for 1-2 hours or so. This allows the wine to soften and open its perfume. Older vintages might need very little decanting, just enough to remove the sediment. Domaine La Barroche is usually better with 3-6 years of bottle age. Of course that can vary slightly, depending on the vintage. In the best vintages the wine should be consumed within 8-20 years after the vintage. Domaine la Barroche is best served at 15.5 degrees Celsius, 60 degrees Fahrenheit. The cool, almost cellar temperature gives the wine more freshness and lift. Domaine la Barroche is best served with all types of classic meat dishes, veal, pork, beef, lamb, duck, game, roast chicken, roasted, braised, stewed dishes, sausage, eggplant, tomatoes and cassoulet. Domaine la Barroche is also good with Asian dishes, hearty fish courses like tuna, mushrooms and pasta. The following two wines from Domaine la Barroche are no longer in production. Domaine la Barroche Terroir, produced from young vines, made from 95% Grenache. The vines are among the youngest of their holdings, belonging to Barroche as they are between 15 to 20 years of age. The production averages 1,750 cases per vintage. 2010 was the final vintage. Domaine la Barroche Cuvee Fiancee – Made from 50% Grenache and 50% Syrah, the vines range in age from as young as 25 years, to as old as more than 100 years of age. The old vine Grenache comes from the Terres Blanches vineyard and the Syrah is planted in the Cabrieres lieu-dit. The wine is aged for 18 months, give or take, in large, oak barrels. The production is quite small, with an average of only 350 cases per vintage. This is pure silk and velvet. The wine is incredibly rich, yet it is almost weightless to taste. The freshness in the fruit, coupled with the vibrancy, pepper, length and velvet textures is off the hook. The wine expands, gaining in complexity as it flows across your palate. This is mind-blowing juice with a finish that remains with you for close to 60 seconds! The wine, as you probably already know by now, takes its name from the fact that it\'s made from almost 100% pure, old vine Grenache. The actual blend is 97% Grenache with 3% of various other, assorted varieties. Strong black pepper notes, garrigue, barbecue and ripe, red berries gets things started. On the palate, the wine is full bodied, deep and loaded with olives, rocks, stones and deep, dark, ripe, sweet, spicy, fresh, red fruits. The wine was made by blending 50% Grenache with 50% Syrah. Silky, sweet, fresh, soft, elegant, ripe, spicy red fruits with a depth of flavor kick things off. On the palate the wine shows plush, polished characteristics with an olive and peppery accent that rides on top of all that ripe, juicy fruit in the finish. The wine is made from 62% Grenache and various other allowable grape varieties. Earthy, nutty, smoked herbs and peppery cherries gets the on the road. Next, you find all the sensuous, luscious, sweet kirsch you need. The wine is elegantly styled with refined, yet supple textures and a sweet and spicy, kirsch finish. This wine is made from 100% Grenache, hence the name Pure. Earthy with exotic spices, smoke, thyme kirsch liqueur. Rich, long and fresh, with tannins that ask politely for some time, the wine finishes with a juicy, peppery cherry and licorice note. The wine is made from a blend of 62% Grenache, 18% Mourvedre, 13% Syrah and 5% Cinsault, with 1% Clairette rose' and 1% Vaccarese. The floral nose, with its kirsch, thyme and cherry essence really gets you going. Elegant and refined, sweet and forward, this 100% Grenache based wine is quite silky on the palate with a good purity of fruit that's easy to see from start to finish. Luscious, lusty and fresh, with sweet, ripe kirsch, cherries and licorice that feels great on the palate from start to finish. If you like young wines and you have a bottle, pop it for a blast of juicy, sweet, dark red fruits, with a big dose of spice, black pepper and ripe cherries. This lusty wine is ready to go. The blend was produced using 55% Grenache, 25% Mourvedre, 13% Syrah, 5% Cinsault, 1% Vaccarese and the remaining 1% comes from other, assorted grapes. Smooth, fresh and forward, there is a nice sweetness to the polished fruits. The wine was produced from blending 55% Grenache, 25% Mourvedre, 13% Syrah, 5% Cinsault, 1% Vaccarese and the remaining 1% comes from other, assorted grapes. Kirsch, kirsch and more kirsch are tasted in the waves of sweet, ripe, luscious, silky layers of fruit. From almost 100% old vine Grenache. Showing some lightening in the color, the wine offers a classic garrigue, jammy kirsch and smoke filled nose. Supple, rich, elegant and forward, the finish delivers loads of juicy, sweet cherries and Asian spice characteristics. Peppery kirsch, with good freshness, juicy fruits and a supple textured, spicy, black raspberry finish. From a blend of 65% Grenache, 16% Mourvedre, 13% Syrah, 5% Cinsault and 1% other varietals, the wine reached 15% alcohol. Licorice, garrigue and kirsch notes lead to a plush, polished, luscious blast of ripe, sweet, peppery fruits in the finish. From 100% old vine Grenache, the stunning wine is deep ruby in color. Packed with layers of rich, intense, fat, ripe, unctuous, fresh, sweet, ripe, jammy berries, spice and licorice. This is intense, mouth filling and long, yet never tiring to drink. Exciting scents of garrigue, jammy berries, fig, licorice and black cherry get this going. It’s even better on the palate with its fat layers of juicy fruit, fennel and dark cherries. The finish builds in the mouth. Concentrated, lush, rich and mouth filling, the wine is packed with perfectly ripe cherries, kirsch, black raspberry, thyme, jam and earth. Sweet, showy, fresh and vibrant, this is a great expression of 100% old vine Grenache. Powerful, concentrated, plush, ripe and almost dense, there is a wall of dark, red fruit, jam, pepper and earthy notes. The full bodied,opulently, textured finish leaves you with spicy, pure kirsch, black cherry and pepper notes. Before tasting this bottle, I was aware of all the comments regarding secondary fermentations, so I looked for it. There were no issues with this specific bottle. It's hard not to like this Chateauneuf du Pape with all its krisch, garrigue, strawberry, pepper and freshy herb scents. Concentrated with fresh, ripe, jammy berries, this is already drinking great today, yet it should age and develop well for several years. From 95% old vine Grenache and a blend of other Rhone varities, scents of licorice, ripe dark cherries, jam, smoke, pepper and spice get the wine going. On the palate, the wine is rich, full bodied, supple and round. Like many 2007 Southern Rhone wines, it's already offering a lot of pleasure. Full bodied, powerful, slightly masculine in style. the wine is on the structured, classic side. Still, there is lots to like here, with its blast of juicy, sweet, kirsch and garrigue. A few more years could help soften the tannins, making this even more fun to drink. WOW! Luscious, opulent, hedonistic and then some; the wine is concentrated with waves of rich, ripe, sweet, pure, old vine Grenache giving you a beautiful purity of fruit, with sensuous textures and an intensity of flavor that really stays on your palate and senses. Fully mature, the wine is soft, round and almost lush in texture. Medium/full bodied, with loads of olives, black cherry, pepper and jam, this is not a wine for further aging. Produced from a blend of 50% Grenache, 25% Mourvedre and 25% Syrah, this was the debut vintage for the young Julien Barrot.